During our years in Oklahoma, I was still depending on my photo archive from Arizona for painting subject matter. 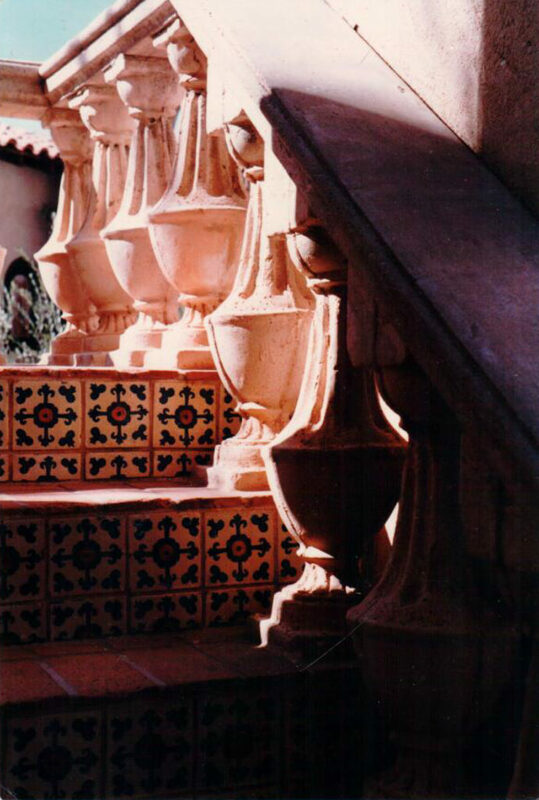 I saw a tile staircase from Sedona, Arizona in Tlaquepaque with great shadows and color. It brought me back home and what I loved. The title to the painting was originally , “Southwestern Staircase,” which was a little weak. One day I was discussing this title with my sister, Sylvia. She suggested “Steps To Parnassus.” I had no idea what that meant. She told me why, and I looked it up. Mount Parnassus in central Greece was, according to Greek mythology, sacred to Dionysus, Apollo, The Greek Muses, and Pegasus. Since Sedona is know for its special mystique, the new Greek title sounded good to me. As usual, I projected the slide image onto a 300 lb. cold pressed, deckle-edged Arches watercolor paper. This is a great surface to work on, as there is no stretching or buckling of the paper. Working in my Oklahoma studio in the spring was wonderful. I was looking forward to the day we moved back to Arizona. The painting came together perfectly. My neighbor and good friend, Rose Fasching, would come over to visit and see what I was painting. She immediately fell in love with the piece, and checked regularly on my progress. Some years later, her children contacted me to purchase the painting for Rose. I knew she loved it, and sold the painting. Love to you, Rose! The painting’s first show was ”The Edmond Art Association Juried Expo ’86.” It was held at the Museum of Art, University of Central Oklahoma, Edmond, Oklahoma, June 1-28, 1986. Juror: Ken Stout. The next shows are in order: “The Arizona Artist Guild Spring Show,” The Gold Nugget Gallery, Wickenburg, Arizona, April 13-23, 1989. Jurors: Stephen DeLair and Ellen Meissinger. 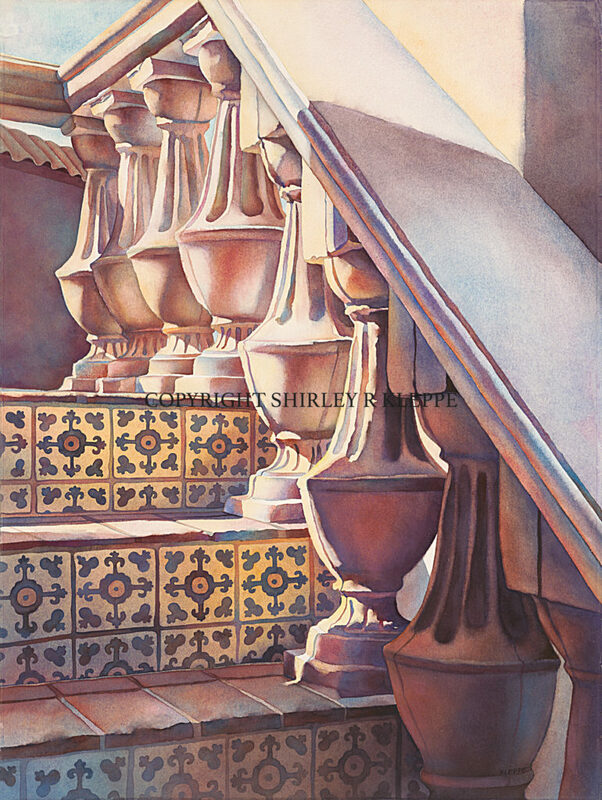 “The Arizona Watercolor Association Spring Show,” The Sedona Arts Center, Sedona, Arizona, May 1-20, 1990, Juror: Jeanne Dobie. “Glendale’s 29th Annual Festival of the Arts, 1990 Juried Fine Arts Competition,” Glendale, Arizona, October 7-22, 1990, Juror: Francis Beaugureau. “The 18th Annual Transparent Watercolor Show,” The Visual Arts Center of Northwest Florida, Panama City, Florida, March 15-April 3, 1992, Juror of Selection: Sam W. Kates and Louise Lewis, Juror of Awards: Judith P Bettes.